The Elder Alphabet is the language that is written on the actual Elder Scrolls. So far, only four such scrolls have been seen in the games, and there is no known translation. There are at least 35 distinct characters, most of which may appear in one of two orientations, which are 180 degree rotations of each other. 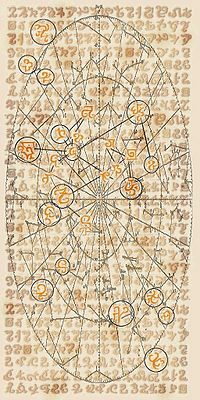 On the scroll on which they are seen, the characters are faded out and obscured by a complex diagram of constellation patterns, with yet more glyphs on top of those, so it is difficult to even transcribe the characters, let alone attempt to come up with a translation. The fact that there are more characters than in the Roman alphabet means that a simple cipher is unlikely to be of much use. The characters, in no particular order, are shown below. *Note: The numbers used below are arbitrary and not based on any established lore. They are included simply to aid in discussion, as there is no other known way of identifying individual glyphs. *Glyph pairs #2 and #3 are 90-degree rotations of each other, the only instance where this occurs. *Glyph #23 has 2 variants in one of its orientations, one of which is missing a stroke. In addition to the small glyphs that make up the background text on the scroll, there are 26 larger glyphs that appear on top of everything. Each of these is unique and most do not appear to match any of the smaller glyphs. 17 of them are circled, while the remaining 9 are not. They are listed in top-to-bottom/left-to-right order below. This page was last modified on 26 March 2018, at 12:27.